March 29, 2015, 10:35 a.m.
John, you’ve got it all wrong. Debt is money. If gold were money I would want a lot of gold, but not if it was stolen. Debt is money. I want a lot of debt but not if it’s defaulted on. In other words the cash in my wallet, the electrons in my bank account, are debts, a promise to pay in the future. Debt is the new gold. I want lots of debt, lots of cash debt notes. 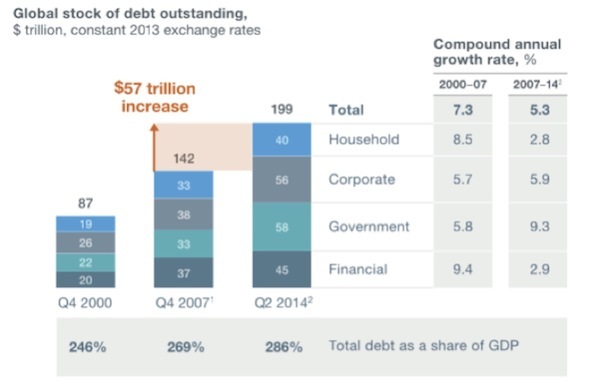 The world is getting richer and richer as the debt expands, right? Using debt as money leads to inequality. Wall Street prints one hundred dollar bills for five cents. The rest of the world works all day for five cents. What’s wrong with that scam, I mean, business model? I just don’t want to be holding any debt, any debt notes, any bank debt currency units, when the whole thing crashes. Please do me a favor and call me the day before the crash so i can buy stuff instead of losing all my debt notes. Thanks. March 29, 2015, 10:30 a.m.
I’m glad to be able to comment on this article. I want to point out that the Japanese story contradicts the opening statement. In the opening you state that the eventual end will be a disaster for debtors, while in the story you show it can be a disaster for creditors. This is the whole point, of course, about how the public authorities decide on relief, and especially so for Greece and Ireland, where private sector debts or loans were converted into public obligations. Iceland refused this conversion, wisely so in my view. Returning to the consols discussion: the experience with Consols to pay for the wars with France resulted in many lessons fur public and private finance. 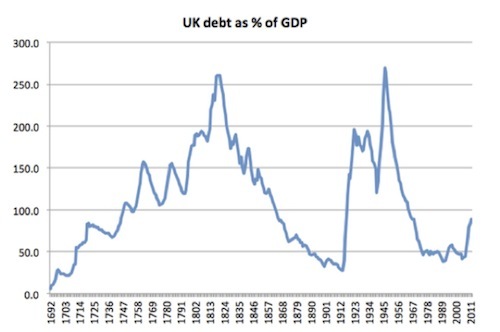 The first was that Britain could raise more in debt than the much larger French economy could raise in revenue, and that Britain was able to do so because foreign investors, including some from France, felt safer with money in London than with anything they could invest in locally. The second was that the payments made served as a base income that could be leveraged productively in the private sector. A Jane Austin character with an income of 10000 a year from consols was a much better credit risk than someone with 10,000 a year from his own estate or business, and his collateral much more certain. This may have played a significant part in financing the growth of British manufacturing. The third lesson of public finance was the absolute priority which the British government gave to making the interest payments on the consols, even as government spending fell after the end of the wars. This is what made consols a better investment than most rival government’s bonds. March 29, 2015, 10:17 a.m. This is a centuries old doctrine that keeps coming up if needed for ideologic or self serving purposes. Public Principles of Public Debt (Collected Works of James M Buchanan) is the authoritative refutation of this tenet, easy enough to understand even for economists. From around the 1950s. If I remember it correctly Buchanan was a fellow Nobel recipient to Krugman, perhaps they were a bit more earnest back then. March 29, 2015, 9:42 a.m.
Excelent, both in terms of content, and the way you present and deal with it. Heinlein/Asimov, Hayek/Keynes and now we have Mauldin/Krugman. It is the perfect time to put things in the adecuate perspective, go ahead, continue the same way! March 29, 2015, 7:41 a.m.
John, you have again presented a stimulating article that presents cogent arguments about To round out this topic I would like to see a series of articles about credit. To my knowledge the level of debt that has been accumulating in the USA has been significant since the Civil War. Somehow credit has been raised to do this. What are the sources of this credit, how has it been created and who or what controls these massive amounts of money? March 29, 2015, 4:30 a.m. I have been reading most of your letters since buying your book Code Red. I live in Australia and am an avid follower of markets. My training is the physical sciences. I agree with much of what you have to say although I think your writing is coloured by not too small a proportion of patriotism. One point I would like to make on this particular letter is concerning this statement that you make and the volumes of words that devoted to it. Unfortunately economics most of the time masquerades as science. When science is applied to economics to try and answer the questions, the words have to give to things that less people can easily understand, mathematical models. In mathematics presuppositions are more commonly known as axioms or postulates . I would suggest if you have time to study the history and very significant implications of the Parallel Postulate or Euclid’s Fifth Postulate. In essence presuppositions in the strictest sense are essential to the understanding of the physical world, these are the things we use to construct axiomatic systems to describe it. In the case of Euclid’s Fifth Postulate, the world shattering realisation was that if we use the negation of our presupposition, we can build a geometry that is no less inferior in its description of reality than the original geometry from which we started. Maybe the BIS, McKinsey Institute, yourself and Krugman can all be right. Without solid models all you might be engaging in is a semantical war of words. March 29, 2015, 3:30 a.m.
Dear Mr Mauldin, as a small business owner in Europe it is enlightening to read your top-down view as I normally look at the economy from my perspective “from the bottom”. I am part of a generation that finished their education in a crisis that was big enough to make one careful but not big enough to make one scared. A good prejudice for a small business! I have lived a good live so far on a low income with a few simple rules: fun item = save for it, education or tool = borrow money. Car? Get the cheapest that will do the trick. House is in the middle, save a bit, borrow a bit. But the low interest rates from Draghi are having an effect and it is plain scary what the results are on me and my surroundings. If I want to buy something the price is inflated, if I want to sell the same item it’s a crisis so demand is low. The low interest rates make it possible for sellers to wait/hope for better times. House prices are a good example of this process. Most places I look at have been on the market for 5 years or more. Draghi sees it as a success, I see it as a disaster. But Draghi’s pockets are deeper than mine, so I will go ahead and buy that nice house with a workshop. I just hope that I can pay off most of the debt before interest rates go up. March 29, 2015, 1:40 a.m.
Actually, what people believed in Galileo’s day was not that the earth was flat but that it was the center of the solar system/universe. People had known since ancient times that the earth was round. Eratosthenes estimated the diameter of earth to well within an order of magnitude about two centuries before Christ. March 28, 2015, 11:37 p.m. Excellent piece. How odd to claim that debt is simply money we owe ourselves… On an aggregated level, that may be true. For every debtor there is a creditor. But on a very personal level, we all know it is not so. If you lend your neighbour US$ 100, then it doesn’t matter to the neighbourhood if the money is paid back or not - they neighbourhood is neither better nor worse off whether the debt is repaid or defaulted upon. But between yourself and your neighbour it makes a huge difference! For your neighbour, assuming he has every intention of paying back, the 100 US$ he gets and then spends is US$ 100 he cannot spend in the future – he has already done so! It is future consumption brought forward, and thus future consumption denied. If the use of the money (consumption) is productive (quality debt), say by spending it on skills training, or technology that makes him more efficient, it may enhance his ability to pay it all back whilst even making himself richer. But if the use of the debt is not productive he is simply taking from his future (or that of his children), denying himself the possibility to spend that money elsewhere at the time of payback. Unfortunately the quality of debt is closely and inversely linked to the quantity of debt. At low levels of debt economies tend to generate incremental economic output per unit of debt, e.g. a US$1 unit of debt may generate US$ 3 of GDP/economic output. At higher levels of debt, however, debt becomes counterproductive, i.e. it takes incremental units of debt to create economic gains, e.g. US$ 1 of new debt only creates say US$ 0.5 of economic growth. The global economy’s slowing growth in recent years is directly linked to the explosion of debt in the past 20 years and that is exactly what Reinhart and Rogoff have shown in “This Time is Different”, except when they did so debt levels were much lower than they are today! March 28, 2015, 11:24 p.m.